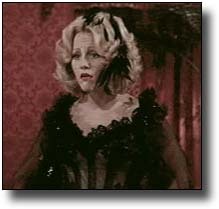 Madeline Kahn is Lili Von Shtupp in "Blazing Saddles"
Who HASN'T heard of "Blazing Saddles"? It is without a doubt one of the funniest comedies ever made, a true classic -- perhaps director Mel Brooks' best work (although it may share that honor with "Young Frankenstein," the director's other masterpiece that came out the same year). The cast is beyond reproach. The late Cleavon Little is excellent as Bart, the role in which director Mel Brooks had originally hoped to cast cowriter Richard Pryor. Gene Wilder is a hilarious Waco Kid. Harvey Korman is at his devious best as Hedley -- that's Hedley -- Lamarr. Slim Pickens is also good as Taggart, and Brooks appropriates two supporting roles, those of the incompetent Gov. William J. Lepetomane and an Indian chief, for himself. But for me, the film's finest moments belong to Madeline as saloon singer Lili Von Shtupp, a devastatingly funny Marlene Dietrich lampoon. This was Madeline's first film for Mel Brooks, and their happy association would continue in three future films, all well-received. Her performance in this film is absolutely hilarious; her performance of the song "I'm Tired" is funny as much because of what Madeline does with it as because of Brooks' lyrics. She is absolutely brilliant. Apparently, the Academy agreed -- they awarded her an Oscar nomination for her work here.